Well when I picked the car up the tires were old and cracked; the date stamp on the side indicated they were made in 1998. I didn't have any confidence they'd hold up for the 1200 mile trip home so I took it immediately to America's Tire and got new tires for it before I drove it home. I went out to the hardware store today and picked up 3 of the small spacer washers; I'll start with 2 on each side and we'll go from there when I get it aligned. I couldn't find the large washer though; it seems it's not a standard size of any kind so I emailed Ray at R.D. ; hopefully he'll have one. If not, I'll try a few other sources. It's 2" wide, 1/8" thick and has a 7/16" hole. I appreciate all the comments and interest from everyone! Having said that, I think Bean or r.d. should have something for you. You might want to make something yourself if they can't help and you're handy. R.D. had one of the washers and it's on the way. Took the headers and exhaust system to a place today to get them ceramic coated. Removed the old rusted exhaust manifold studs from the engine. While working on removing the studs I just happened to look down and really took a look at the battery. 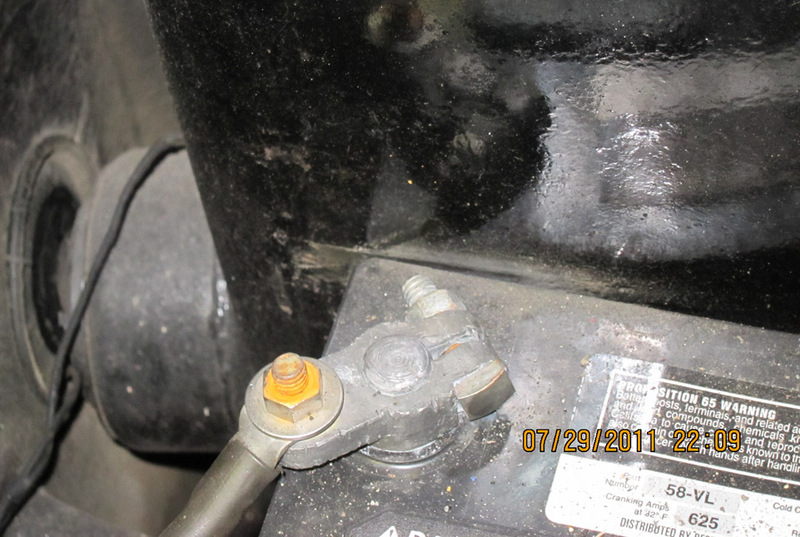 Not only is it the wrong size (too wide) but it had begun to wear a groove into the gas tank! Thank god it didn't succeed in wearing through and causing gas to leak into the engine compartment....right next to the headers.... while I was driving this down from Seattle! Overall the car is in good shape but some of these "little" things; bent radius arm, battery trying to wear through the gas tank....geez. Needless to say I'll be removing the battery and I think I'll get a small Braille battery to replace it. Now I have to figure out what I'm going to do about the gas tank. Can they be removed and repaired/replaced without taking the body off? Not only that, but the posts should be on the engine side rather than the gas tank side (although you situation doesn't appear to be dangerous). IIRC, it's pretty much the smallest car battery you can get. The size designation in the workshop manual is obsolete. Some guys are able to translate to the new designations. It's worth a try. I bought one at a local chain parts store (Advance Auto), but now I've got an Optima and I don't think they used the same size designations. BTW, the guy who rebuilt my alternator (for a lot more money than I would have liked) was not high on Optima batteries. He prefers regular batteries for street cars. Can they be removed and repaired/replaced without taking the body off? Yes, they come out through the bottom. You can estimate how high you have to lift the car, by measuring the tank height. If you need a new tank, Steve Veris would be the one to contact. He made both tanks for my S2/Zetec and the sill tanks for my Peerless GT. I was so focused on your battery problem, I didn't see your question about your tanks. As HealeyBN7 said, they come out from the bottom so you have to jack the car WAY up. The little I could see of the top of your tank(s), it looked pretty good. Often, water collects on the top of the tank (because of the design that ensures that) and the tank starts rusting from there. If your tanks are not rusting, I wouldn't mess with them unless you really want aluminum tanks for some reason (not that there's no reason to want them). If they are rusting, then I would replace them with aluminum ones based on how rusted the steel ones are. There is probably someone on the lotuseuropa yahoo group that has them or knows where to get them. Failing that, I think Richard at Europa Engineering in the UK has them, I believe. I've noticed in studying various photos of engine compartments that some are showing these rubber donut-shaped supports on the frame crossmember which look like they're supposed to support the removable trunk well. I haven't been able to find these in the parts manuals. Does anybody know what they're called and a source for them? I tried R.D. but he doesn't have them. In the post apocalyptic mad max world, he who controls the McMaster-Carr warehouse, shall control the World! Some of the jute matting on the firewall has come loose at the bottom. It looks like it's original to the car and is a bit "old". Is it possible to replace it without having to remove the body? The jute on the firewall will come off without taking the body off. If you're planning on pulling the engine, that would be a great time to replace it. If you move the water pipe to the t-stat, you might be able to replace it with something else. 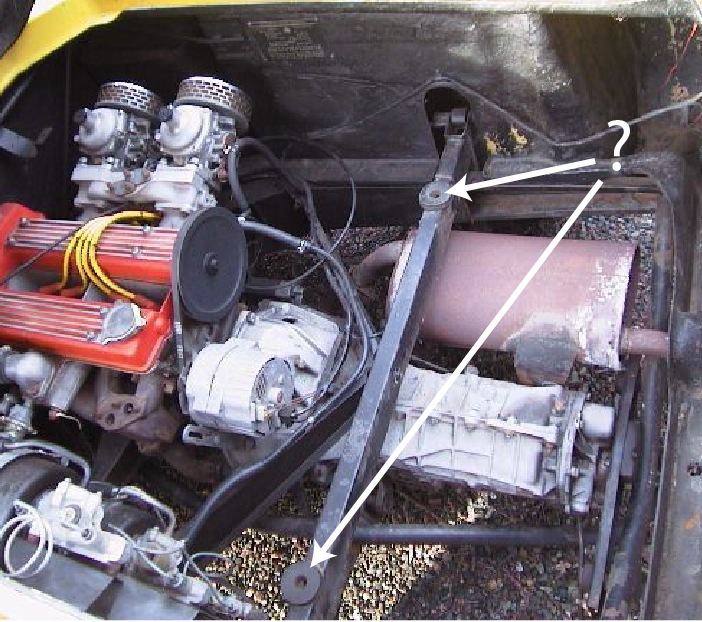 Some guys on the lotuseuropa yahoo group had some interesting ideas. I got some mylar covered foam rubber insulation at J.C. Whitney. I was able to get a mounting kit, but the last time I looked, I didn't see it. If you're interested, you might try calling them or if they have it, you can try their online chat thingie. Of course, if you want to keep it "original", I think you'll have a hard time finding a close replacement so you might want to see what you can do with the one you have. With the engine out it would be a marvelous place to work. You could get all the detailing done and it would look great. Consider some of the new insulation materials that deaden noise and reflect heat. If noise isn't a problem for you maybe something like Lizard Skin Ceramic Insulation would be a good choice. Yeah I was kind of thinking it's an "engine out" type of operation. I'm not planning on pulling the engine at this time though so that may have to wait. I had something strange happen tonight.... all 8 stainless steel exhaust manifold studs went into the engine exactly the way they were supposed to without any issues whatsoever... kind of had me spooked. 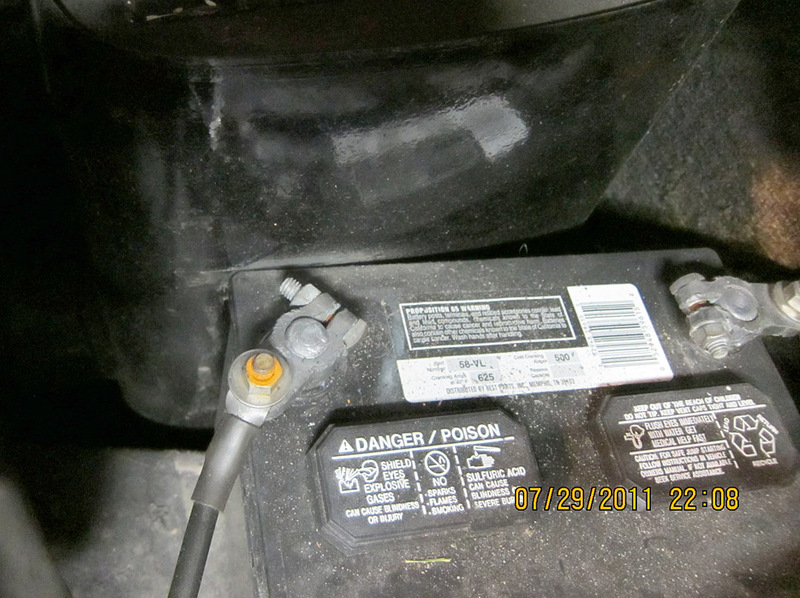 Pulled the battery and fortunately the "damage" on the gas tank is merely the black paint being scraped off. It will touch up easily with some gloss black enamel. I'm putting a Braille battery in there; it's about half the size of the old one. Got most of the radius arm assembly put together including rear brake assembly. I decided to wait until I finished installing the headers (which are ready; I just have to pick them up tomorrow from the coating shop) before installing the radius arm. The access to that side of the car is much easier without the radius arm/brake assembly/lower spindle in the way. Tomorrow the headers, exhaust pipe, muffler goes in (they're all ceramic coated now); the radius arm and left rear suspension goes together and in. Technically it will be driveable but I noticed when I undid the brake line to the left rear radius arm no fluid came out which I'm assuming means the rear brakes weren't/aren't functioning. The whole brake system was supposedly redone according to the P.O. so I'll bleed the system and see how it works. I noticed the boosters look rebuilt but have been bypassed. If I can get it driveable enough to get it to AAA so the inspector can verify the VIN and I can get my permanent registration, that will be good enough. Picked up the headers and exhaust system this morning. They turned out great! Just the color I wanted; ceramic coated in titanium. Ran by the hardware store and picked up the bolts and washers I was missing to mount the muffler to the trans. 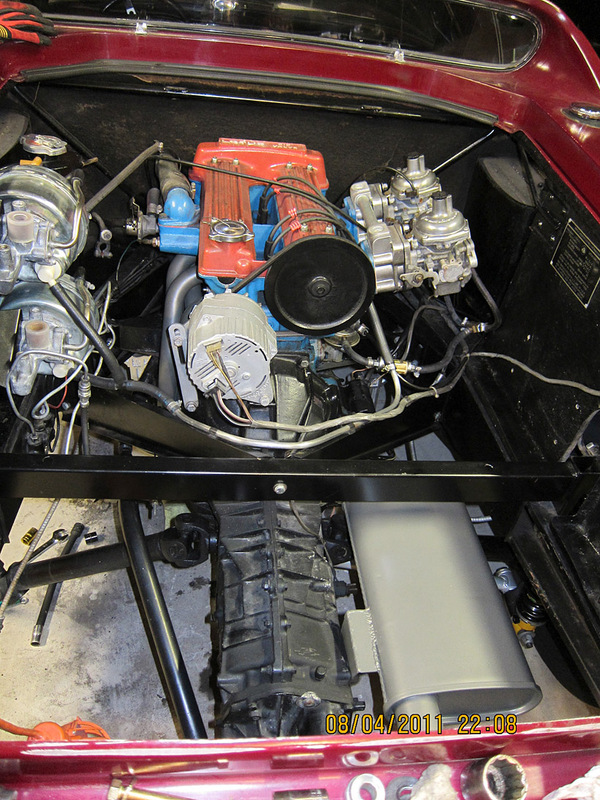 I'll put the headers and exhaust system in later tonight when the temperature outside drops to a tolerable level. Had an interesting evening. In order to put in the headers I had to remove the engine mount on the driver's side. Did that; headers went in from underneath surprisingly easy. They were a little tight fitting on the studs but I attribute that to the extra thickness of the ceramic coating in the holes. Got 7 of the 8 nuts on and tightened down. The last one which is under the thermostat housing and nearly impossible to see proves impossible to put on. The stud sticks out just far enough that there isn't enough room between the header wall and the end of the stud to put even the washer on, much less the nut. Since the header has a nice thick, solid flange all the way across I decide to try leaving that one nut off for now and see if there's any exhaust leakage. Wasn't happy about that but I go to reinstall the motor mount and it won't go back in; the headers are just a bit too close to the mounting studs and won't let the motor mount go back into place. It quickly becomes obvious I'm going to have to loosen the headers I just loctited on and move them out far enough for the motor mount to fit. At this point I've begun using colorful metaphors. So I loosen the headers, move them outward a bit, motor mount goes into place. I tighten everything back up thinking "finally" and attach the muffler to the side of the trans. 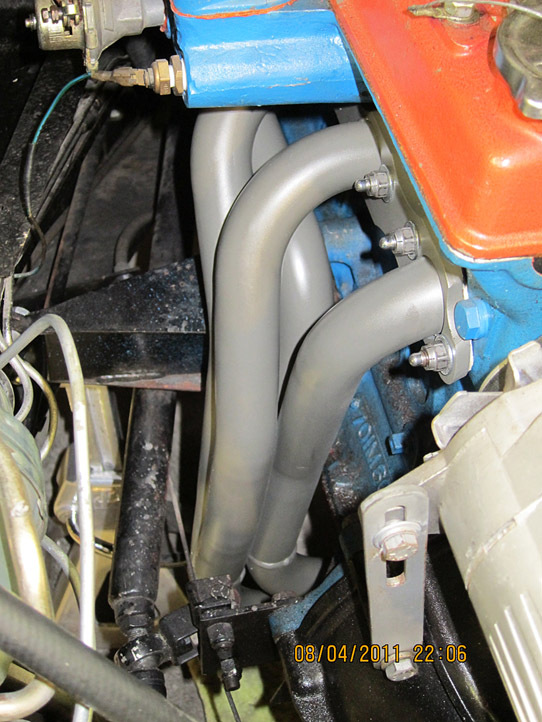 I go under the car, put the connecting pipe into the headers which fits fine, get out from under the car and notice there's absolutely no way that pipe is going to fit into the muffler. Not only is it several inches too long but the pipe coming out of the muffler is at the wrong angle; it wouldn't even line up if the connecting pipe was the right length. That was it for me for the evening. So tomorrow I'll have to take the muffler and connecting pipe to a local muffler shop, have them cut the connecting pipe to the correct length (I marked it with a pencil); cut the pipe off the end of the muffler and re-weld it facing the correct angle. This of course is going to ruin the nice ceramic coating on the end of the muffler. I'll have to take it to the shop that did it and see if it's possible to re-coat just that end; if not....or if they're going to charge too much... oh well. I'll just have to paint it a gray engine paint. What I expected to be a simple bolt-on installation turned out to be anything but that. I wish companies would do a better job of checking fitment before sending things out! As a result of all the extra time I had to spend, I didn't get the radius arm installed. Hopefully tomorrow the exhaust system drama will be easy to resolve and I can get the rear suspension back together. Here's a few pics of the evening's events. The headers finally installed after all the install drama. 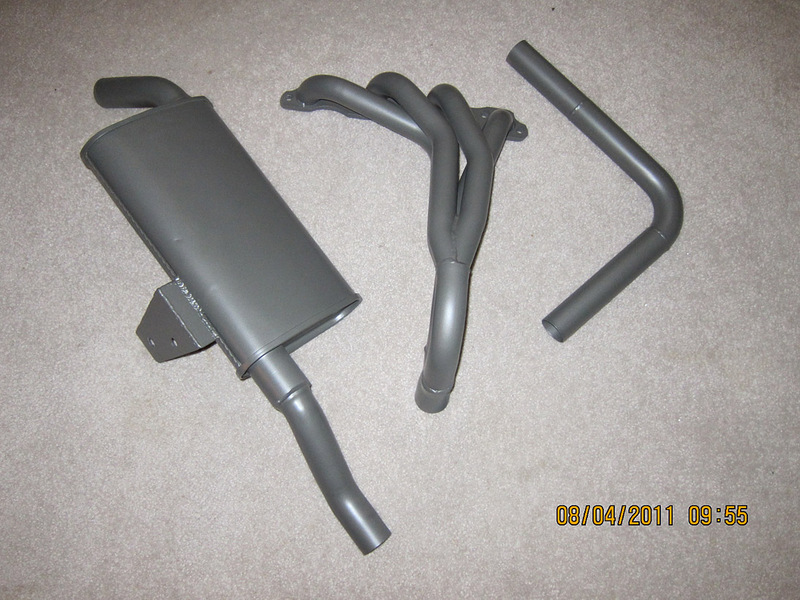 Mismatch between connecting pipe coming from headers and the pipe on the end of the muffler. Sorry for your trauma, but thanks for the write up. 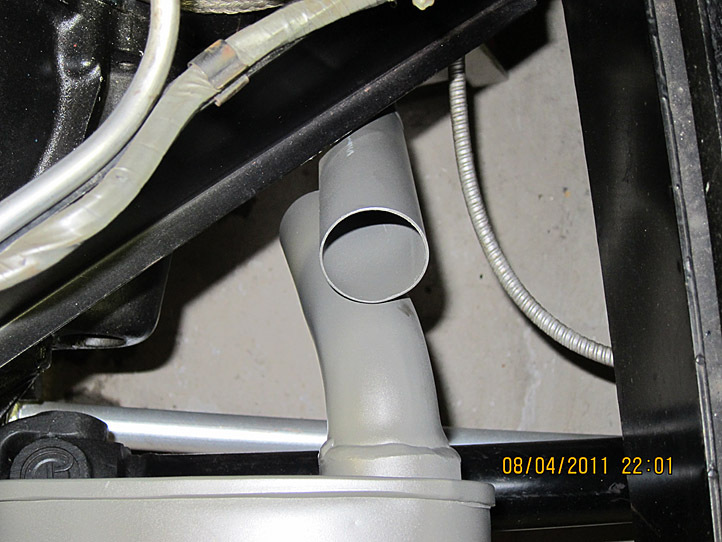 Exhausts are notoriously likely to bring up such issues. I had to put an entirely different starter on my Rover in order to get the headers to work (from a 60s Buick, another story). So what I'm reading in here is "Don't assume anything". Captain Hindsight (from South Park) would say : "Should trial fit it all before coating and loctite"
You are on a Special path (sorry I could not help it), will be worth it. "Since the header has a nice thick, solid flange all the way across I decide to try leaving that one nut off for now and see if there's any exhaust leakage." Bad Idea. Once this thing heats up, & "works" around a bit, you will more then likely get a leak. Best case, an annoying "ticking" noise. Worse case; Backfiring on trailing throttle, erosion of the head at the flange, warping of the exhaust valve, & subsequent burning & loss of compression on that cylinder. I'm thinking the twin cam uses UNF fasteners, ie, fine thread. Welcome to the world of Lotus aftermarket parts (pretty much the only kind there is for Europas)! Definitely fit first, then finish, then install is a good plan but not always possible. It's good to get in the habit of trying to do that. I had to learn the VERY HARD way (over and over)! I agree with thruthefence concerning the header mounting nut. I would try really hard to get that last nut on. Would a longer stud help? Maybe as a last resort you can have somebody counter bore the hole to give you more threads. In spite of your drama, it sounds as though you're making good progress. Keep it up and post pictures! Thanks for the link! I'll definitely look into that. Right now all I need to do is get it running so I can get it to AAA so the inspector can verify the VIN and I can get my permanent registration. The way things are going right now, that should be sometime next week. Got the exhaust system sorted out. Got the new radius arm installed. Right now I'm taking a food break and then I'm heading out to the store to pick up some loctite remover; I can see small amounts stuck inside the hub splines. Once I get that cleaned I can put the hub and brake drum back on. It's all ready to go; just needs cleaning, new loctite and it will be done. Then I need to press the bushings into the lower link, re-install that and the SPAX shock/spring unit and put the rear wheel on. Then I can lower the car onto it's own wheels in the back for the first time in weeks! Gettin' there....next week should see it drivable again.